A woman was killed in an accident with a duck boat at Beacon and Charles streets in Boston on Saturday. The duck boat that killed a woman driving a scooter on Saturday morning in Boston is not the first fatality involving the popular tour vehicles that run on land and water. 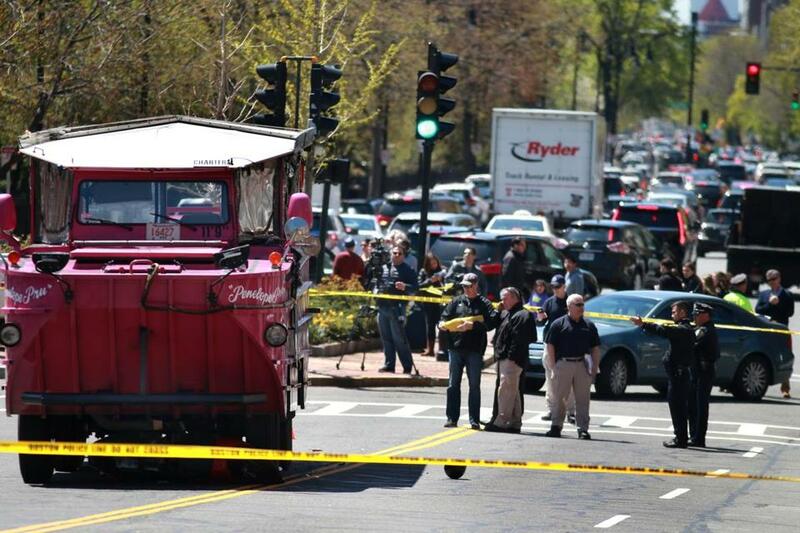 Nearly six years ago, a duck boat suffered a brake problem and crashed into several vehicles as it traveled onto the ramp of Charles Circle. Five people were treated for minor injuries, according to past Globe articles. Earlier that week, another duck boat was involved in a crash with a vehicle that tried to maneuver around the bulky vessel near Government Center. There were no injuries in the crash, the Globe reported. Duck boats are amphibious vessels that were once used by the US military in World War II. They have since become popular tour vehicles, allowing visitors to take in sites on land, and by sea, in such places as Boston, Philadelphia and Seattle. In the last six years, fatal crashes have also occurred in Philadelphia and Seattle. Five international students visiting Seattle in September 2015 died when a duck boat collided with a bus on the Aurora Bridge. Four students were killed at the scene, and a fifth student later died from her injuries, the Associated Press reported. Investigators found a problem with the front axle. State regulators shut down operations for four months after the incident, citing hundreds of safety violations. In 2010, a duck boat in Philadelphia that stalled in the Delaware River was struck by a city-owned 250-foot barge piloted by a tug boat. Thirty-five passengers and two crew members were sent into the water. Two Hungarian tourists — 16 and 20 years old — drowned, according a Philadelphia Inquirer report. The tug boat operator was sentenced to one year in prison for the crash, the newspaper reported. He had received a call from his wife that their 5-year-old son had been deprived of oxygen for eight minutes during corrective eye surgery. Panicked, he had researched the problem on his laptop and made multiple calls to relatives. He moved from the upper to the lower wheelhouse -- limiting his vision of what was in front of the barge -- and turned down the volume on the marine emergency radio. The families of the tourists later received a $15 million settlement, with an additional $2 million to be split among 18 passengers who survived the crash, according to the Inquirer report and multiple Associated Press reports. The lawsuit alleged rampant texting and lax security practices that included not ensuring a working air horn on the day of the crash to alert other boats of a problem. Last year in Philadelphia, a 69-year-old Texas woman was struck by a duck boat while on vacation. Elizabeth “Liz” Karnicki was crossing the street with her husband when she was hit. Jill Karnicki said she thinks duck boats should be taken off the roads in major cities. Globe correspondents Rebecca Fiore and Mackenzie Grady contributed to this report. Nicole Fleming can be reached at nicole.fleming@globe.com.